Porar Review 2019: Is Porar a Good Hosting? Established in Thailand in 2001, Porar has grown to become one of the top ten biggest hosting companies in Thailand. They provide web hosting services to more than 50 websites of publicly-owned companies as well as over 5,000 websites in Thailand and several other countries, including the United States, Germany, and Malaysia. Porar is one of the most preferred web hosting providers in Thailand. The company was founded in 2001 and today provides web hosting services to more than 50 websites of publicly-owned companies in Thailand as well as over 5,000 privately-owned companies. Porar also has a number of customers in the United States, Germany, and Malaysia. With modern security protocols and a 100% update guarantee system, Porar lives up to their commitment to keep their customers’ websites and data secure. The Porar website is available in both Thai and English. As you may be able to tell, they’re doing their best to steer customers towards their Linux-4 and Linux-5 plans; any plans below that are severely limited in terms of scripting functionality, database speeds, and availability of SSL certificates. That said, if you’re only hosting a simple, largely static website, the Linux-1, Linux-2, and Linux-3 plans will more than suffice. Renew domain name for free for a lifetime – Porar only charges their customers to register their preferred domain name in the first year of web hosting. After the first year, the domain name becomes yours for a lifetime for as long as you keep renewing your hosting subscription with this vendor. 99.99% uptime guarantee backed by a refund – Porar promises their customers that they’ll keep their websites available 99.99% of the time, all year round. The company’s downtime policy will ensure that you are compensated web hosting fees if you experience more than that level of downtime. User interface available in English and Thai – Porar’s web hosting solutions include a control panel that’s easy to use even for beginners. The vendor’s account management interface will help you create, modify, and delete files as well as manage email and databases. Through this interface, you’ll also be in a position to see detailed website statistics including visitor stats presented in beautiful 3D graphs. Porar has invested in high-performance servers located across Thailand and several other countries around the globe. You can choose the data center where you’d like your website to be hosted for faster website loading speeds. Porar’s hosting plans are priced in Thai Baht. They are very expensive by local web hosting standards. Perhaps this is why the company has not included a yearly payment option as it would be extremely expensive. While the higher-end features for Porar’s top-tier plans justify their expensive rates, users can find far more affordable options elsewhere if they’re simply looking for basic hosting with minimal features. Porar doesn’t have a support ticket system. To contact their support team, you can use Facebook, email, live chat, or telephone. You can also send them a message using the contact form on their website. I was quite impressed by the responsiveness of their technical support team. I sent them an email asking for more information regarding some of the software they use. I got a reply within 30 minutes. Their response was straight to the point and all of my questions had been addressed in an easy-to-understand yet not condescending manner. 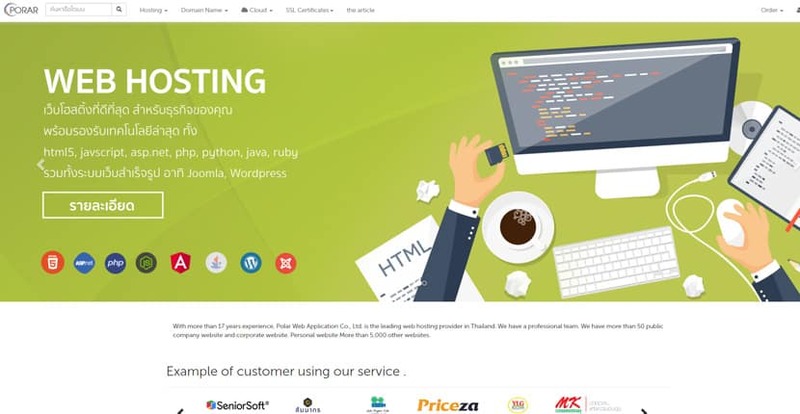 Porar has established themselves as a market leader in the Thai web hosting space by providing high quality, feature-rich web hosting plans to businesses that value the quality of service over the cost. Wondering how Porar stacks up against other Web Hosting companies? Enter any other Web Hosting company and we will give you a side-by-side comparison.